My name is Dawn Chapman, I was born on December 13th 1977. I am a writer, I always kept a diary and then a journal. Now I am here and I transferred all my blog entries from around the internet to here too. They are a very big part of my life, so I wanted to add a special page just for them and for those that are interested. It is a slight work in progress, as they all are. Something always needs doing. 5000 gallons. 22ft long and 18ft wide. 4.8 at its deepest with a shelf around 1ft from the back wall. Gravity fed to Nexus 300. Koi – Approx 30 x Home Bred Matsuawabake, Shiro and Hajiro. 10″ and coming to 18mths old. 1 x Doitsu Kohaku, 1 x Assagi and 1 x Gin rin Ochiba. Solar panels to help with the cost. And CCTV to watch from inside the house… always a bonus when they can’t see you, they act normally. Thanks for looking. Any koi related blogs are tagged ‘koi’ if you do a search for them. This looks excellent! How did you get on breeding shiro? Hi Josh, the parents were Shiro mum and Kumonryu father, so didn’t quite end up with what were all shiro, think there was a good few though, have about 5 I am hoping are shiro, some hajiro and matsuawabake. 🙂 I’m no expert, but it as an interesting experience for sure. Thanks for stopping by. Pretty impressive! I always wanted a Koi pond. Thanks, I love them, just watching them grow is great. 🙂 How is your site coming along? It’s coming along slowly, but on schedule. Since I’m only planning on putting out one new book every few months, there’s not a whole lot to post about until things get rolling. As I said when I shared the link on FB, it looks awesome but obviously requires a lot of time, effort and $ to maintain it. And I love the CCTV idea. You can enjoy your fish w/o leaving the house and don’t make them nervous by hovering over the pool watching them. Cool! Thanks for the comment. 🙂 Defo works. It’s great to watch them, naturally. Hope you have a fab day. Thanks 🙂 Nice to meet you too. Cant make fb work dont know why thats why weve not been on Max’ fb site of late . I like your efforts. 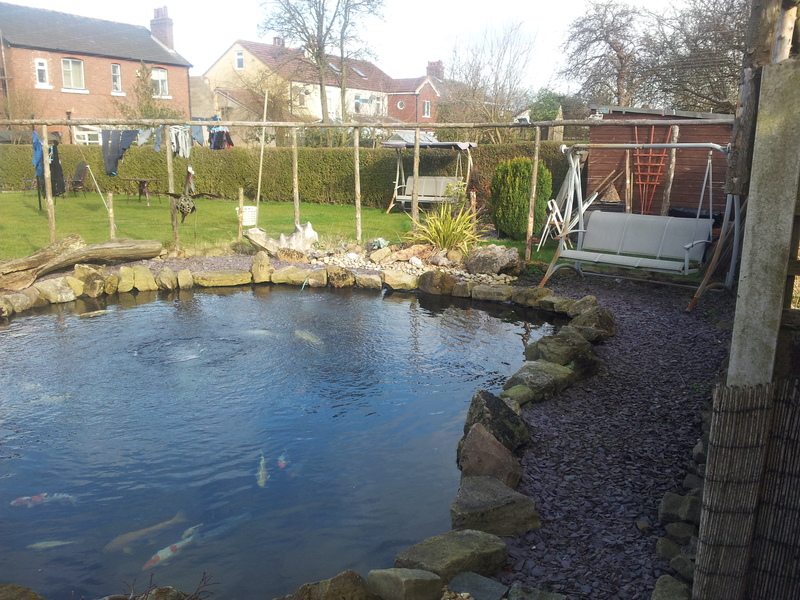 It is good thing that how conscious you are about health of your fish pond. I my suggestion is that I will like to give is; apply fish pond liners for healthy life of fish as well as pond. mmm, neither do I. There used to be one on the last theme I had, I will have to look back into it, thanks for the comment though.